Ballybunion is mostly known for its world championship golf courses, and a lot of overseas visitors come to play golf. However, the Atlantic ocean also offers up many great opportunities for watersports enthusiasts. Maybe you are a golfer who would like to try your hand at body boarding or surfing on your day away from the course? Maybe you’d like to rent a kayak and just chill out and cruise around for a few hours? Maybe you have absolutely no interest in golf and just want to get straight into the sea as soon as you arrive. Well, you can do all this in Ballybunion quite easily. Ballybunion is ideally located to cater for those whose hobbies involve getting off the land and into the water. 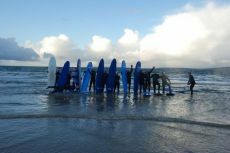 There is a range of options available such as surfing, windsurfing, body boarding and kayaking. If you are staying in the town centre, you won’t have to travel far to get to the two main beaches in Ballybunion. You may wonder why the two main beaches are called “Ladie’s Beach” and “Men’s Beach”. Once upon a time men and women bathed in separate areas, which is where the names come from. Both of these beaches have lifeguards and are blue flag beaches, which basically means they are clean and safe. That said, never take the sea for granted and if you obey basic safety tips, you’ll be sure to have a great day out at the beach. Depending on the weather or the time of year, the beach could be crowded or empty. It will be quite obvious that you will have to take this into account when it comes to any watersport. Usually the less crowded it is the better. Don’t let the Irish weather put you off getting into the water either. You may already own a wetsuit and have this part covered, but you could also rent one, so no excuses getting into the sea! What about the surfboard or kayak? Well, these can be rented too. Just ask around town and they’ll point you in the right direction. You may have to venture beyond the two main beaches to do some wind surfing, but it’ll never be too far from Ballybunion. It’s a bit easier to rent surfboards or kayaks in the town, and you’ll find the surf schools knocking around the beach most days during the summer. Don’t forget that these cater for children as well during the summer months. Ireland has some of the best surf breaks in the world, and the great thing about it is they are usually not crowded. Ballybunion has something to cater for beginners to experienced surfers, and offers cliff and reef breaks for the experts, and beach breaks for beginners. Kayakers can take advantage of the beach breaks, and explore the cliffs on calm days. As well as having fun in the water, you may see some dolphins and all types of sea birds. Ballybunion is also perfectly located for exploring other beaches in the North Kerry area. It’s near the mouth of the Shannon river, so if sailing floats your boat (no pun intended), you can have a go of that as well. Our Guests when it comes to accommodation and restaurants in Ballybunion, and there is something to cater for all budgets.